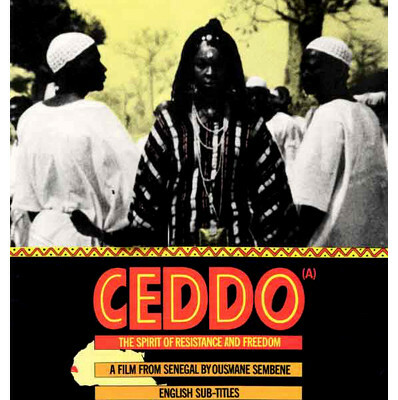 In 17th century Senegal, the Ceddo ("commoners") try to preserve their traditional culture against the onslaught of Islam, Christianity, and the slave trade. When local king Demba War sides with the Muslims, the Ceddo abduct his daughter, Dior Yacine, to protest their forced conversion to Islam. After trying to rescue the princess, various heirs to the throne are killed, and Demba War is killed during the night. Eventually the kidnappers are killed and Dior Yacine is brought back to the village to confront the imam, just as all the villagers are being given Muslim names. “The Silent Revolutionaries: Ousmane Sembene’s Emitai, Xala, and Ceddo,” by David Uru Iyam. African Studies Review, Vol. 29. No. 4. December 1986, pp 79-87. “Films from Senegal, 15 Years of An African Cinema, 1962-1977.” MoMA, No.5, Winter 1978. “Islam in Senegalese Literature and Film,” by Mbye B. Cham. Africa: Journal of the Africa International Insititute, Vol. 55. No. 4, 1985, pp 447-464. “If I Were a Woman, I’d Never Marry an African,” by Fírinne Ní Chréacháin. African Affairs, vol. 91. No. 363. April 1992, pp 241-247. “Popular Culture and Oral Traditions in African Film,” by Manthia Diawara. Film Quarterly, Vol. 41. No. 3. Spring, 1988, pp 6-14. “Reclaiming Images of Women in Films from Africa and the Black Diaspora,” by N. Frank Ukadike. Frontiers: A Journal of Women Studies, Vol.15 No. 1. 1984, pp 102-122.